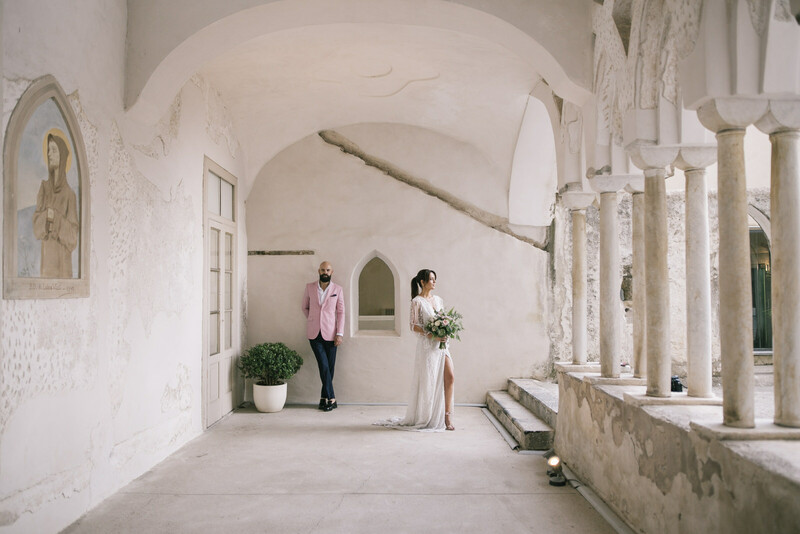 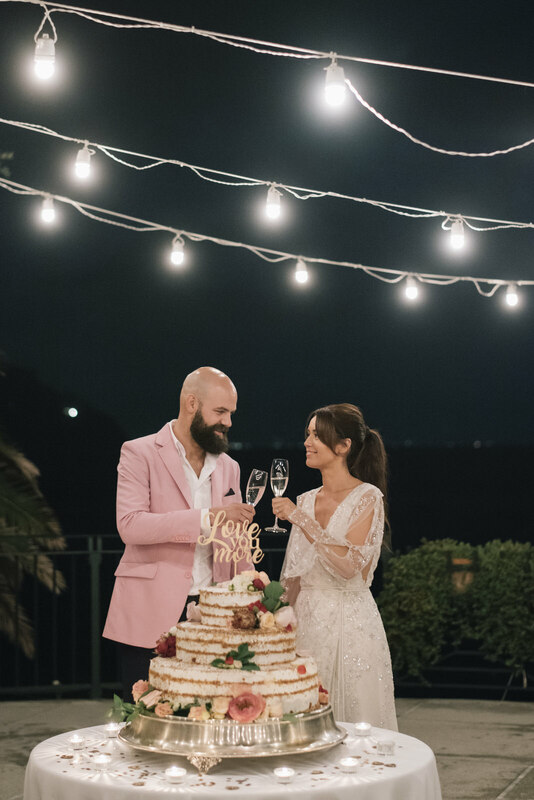 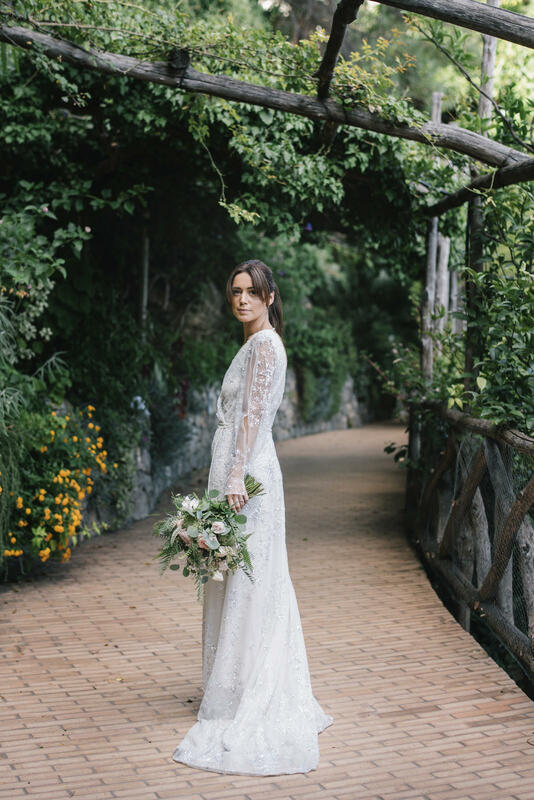 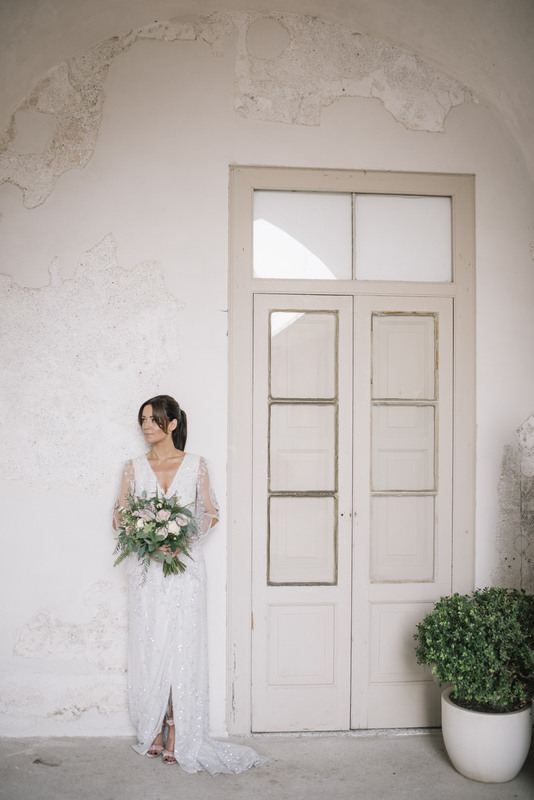 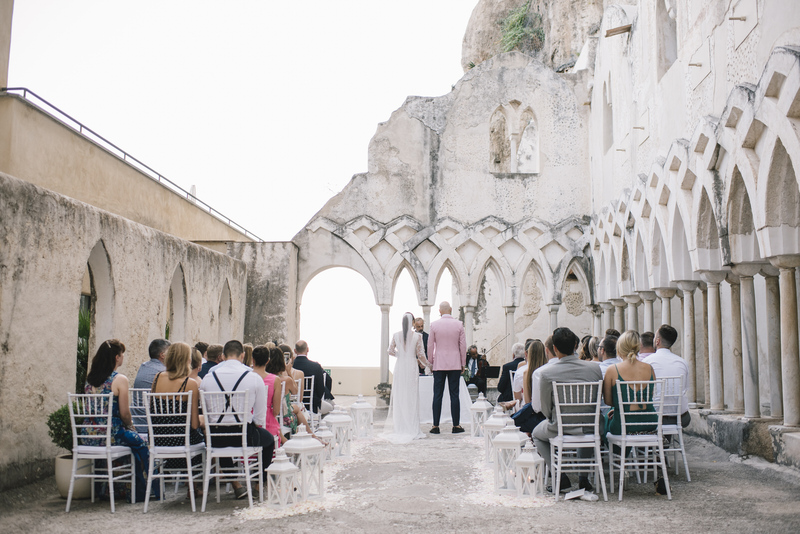 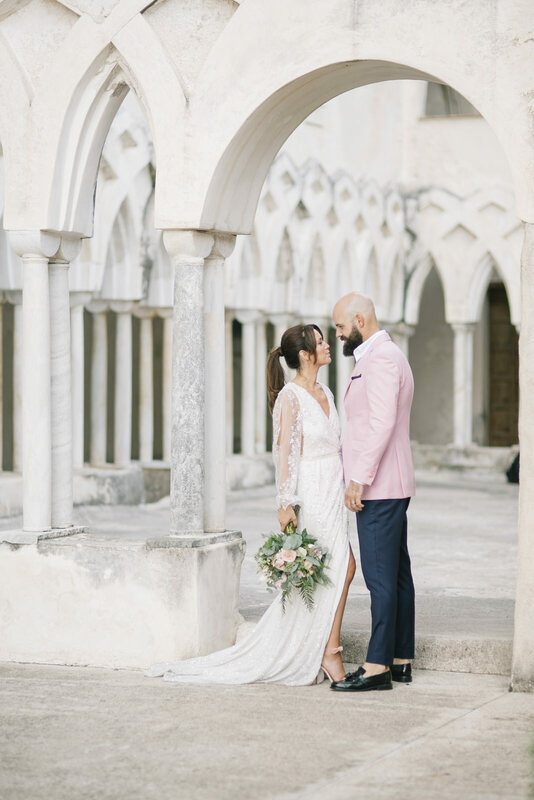 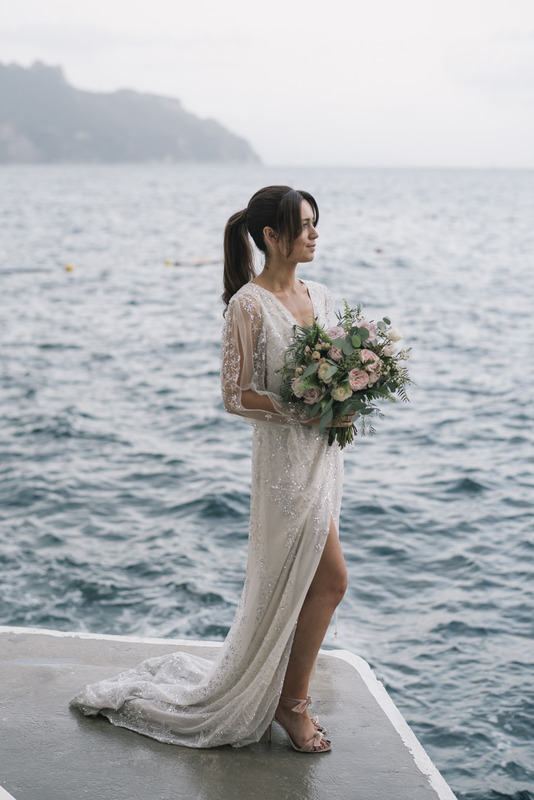 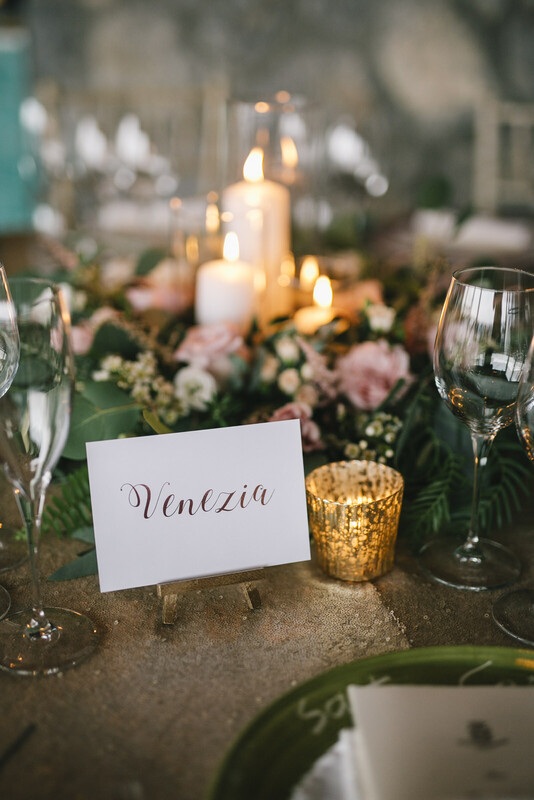 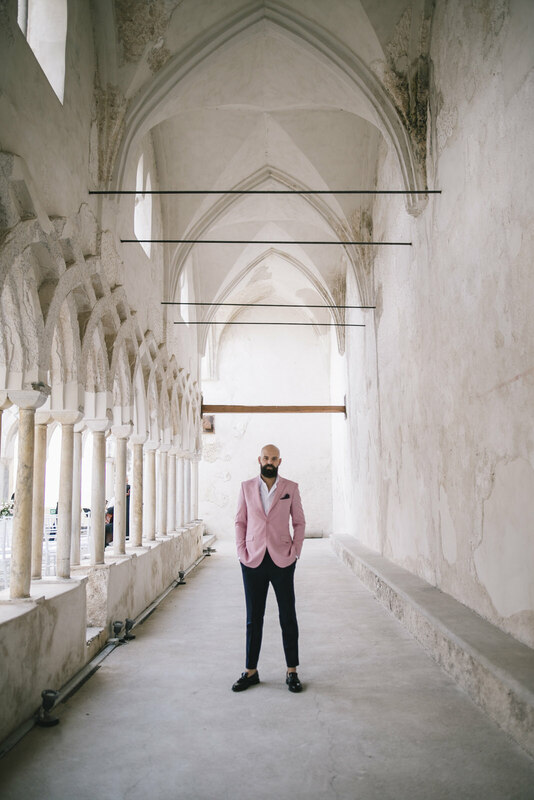 Driven by a passion for breathtaking scenery and intense colours, Alyson and Dan chose to fly to Italy for a romantic Destination Wedding in Amalfi. 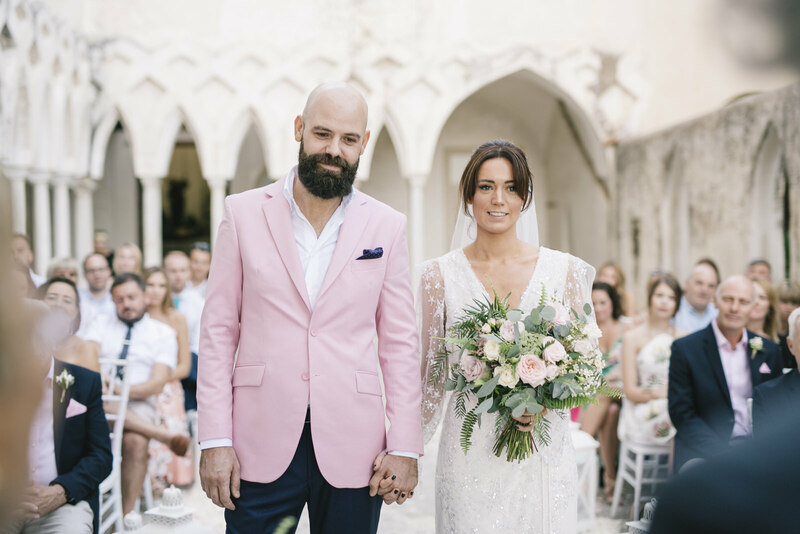 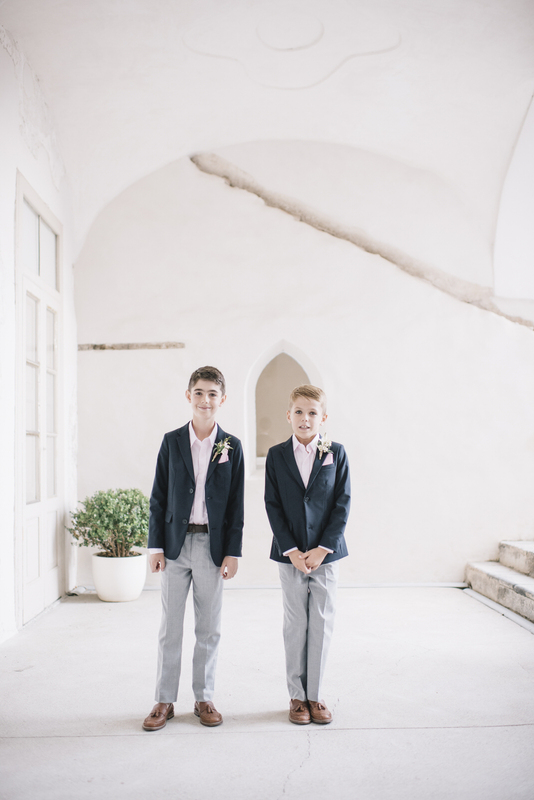 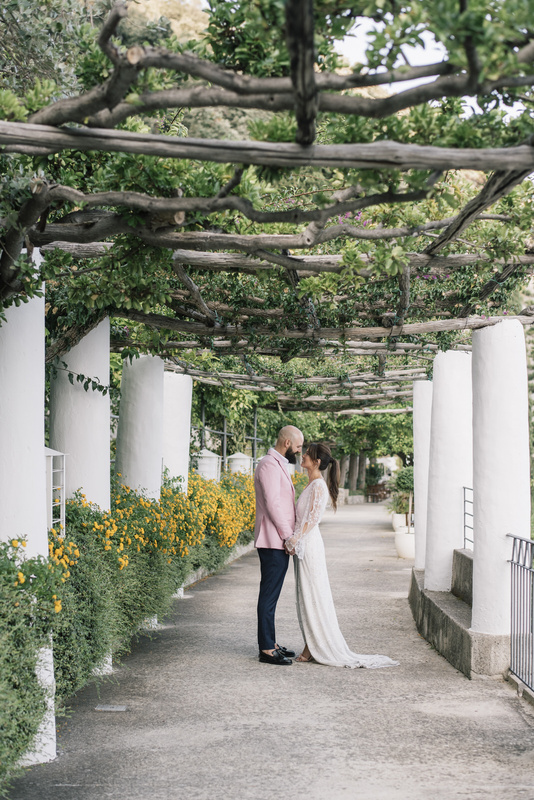 The ceremony was held at the NH Grand Hotel Convento and for the reception Ayson and Dan chose the renowned and wonderful Hotel Santa Caterina. 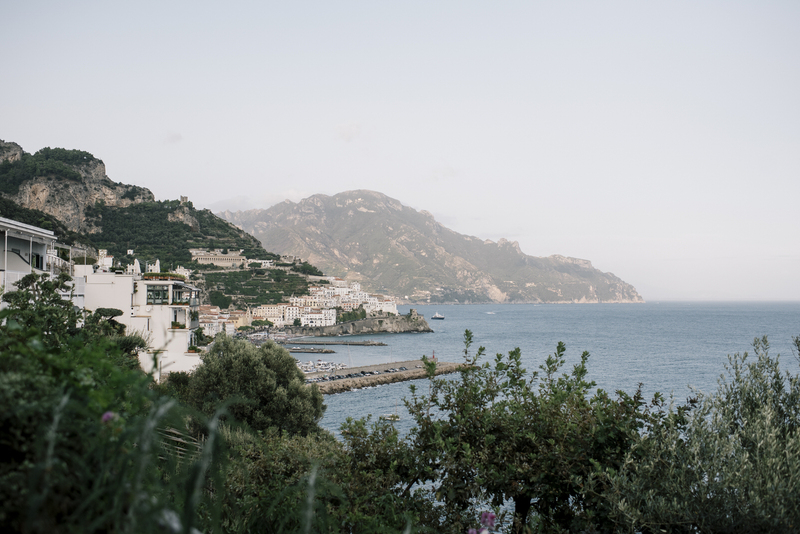 The Amalfi Coast boasts some of the most unique landscapes in the world. 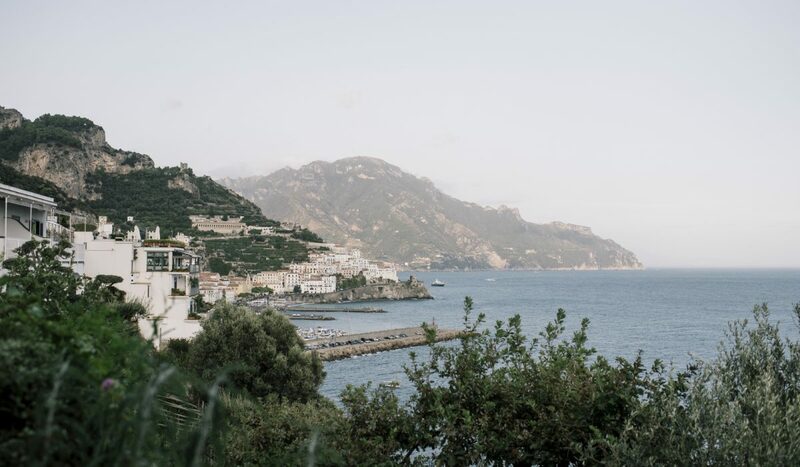 Going through it all means giving yourself the privilege of admiring authentic spectacles of nature with surprising glimpses in which the rocky and wild mountains sink into the intense blue of the Mediterranean, interspersed with small towns steeped in history and art. 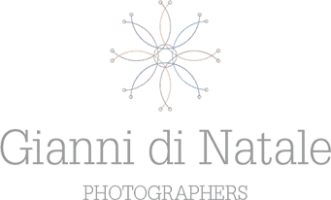 Amalfi is undoubtedly one of the most visited by tourists from all over the world, because of its peculiar ability to offer all the beauty of the coastal scenery, beaches and the sea together with a rich artistic and historical heritage and the charm of the alleys and of the “sottoportici” that characterize the towns of the Amalfi coast. 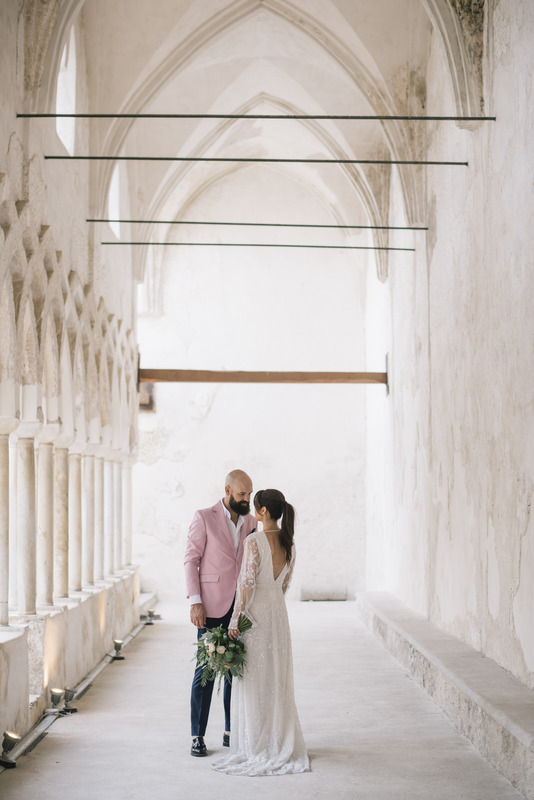 Alyson and Dan chose the wonderful thirteenth-century Cloister of the NH Convento for the civil ceremony. 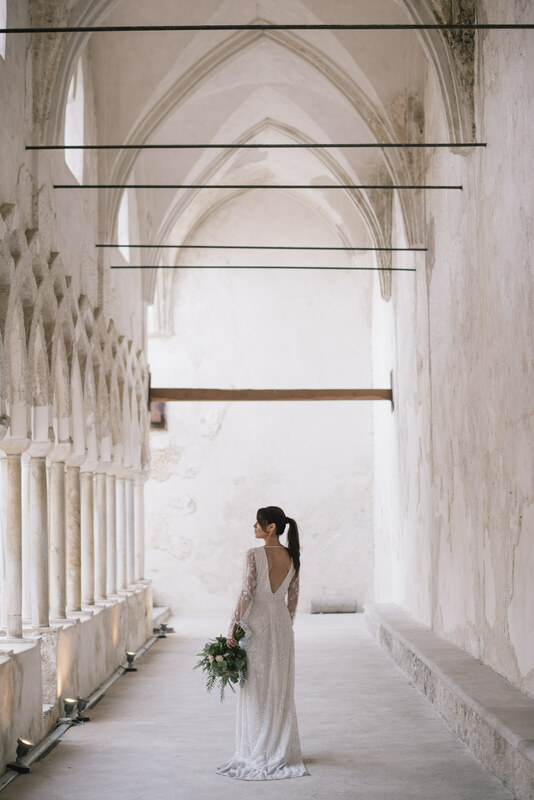 The quadriportico of Arab-Norman derivation, the characteristic motif with interwoven arches that enliven the vaults, the adjoining former convent once home to the Cistercian friars, create a mystical atmosphere in which everything that happens seems suspended in time. 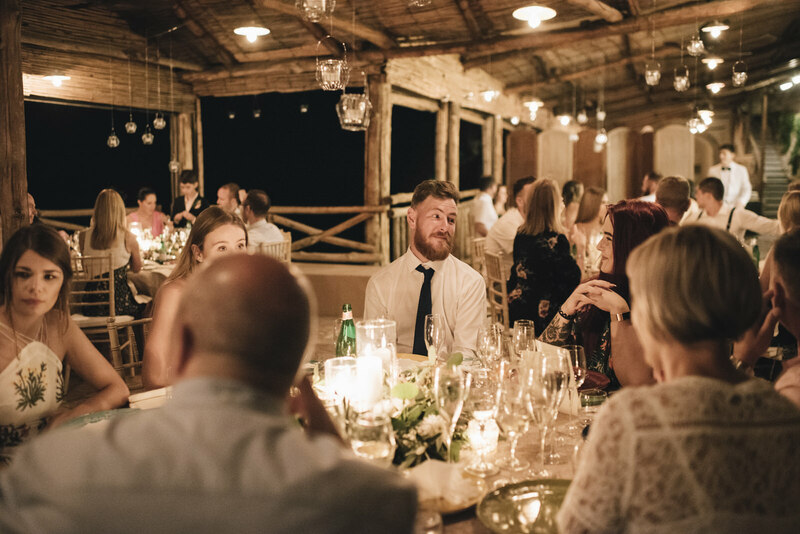 Here Dan waited for the arrival of his wonderful bride, accompanied by a visibly moved father. 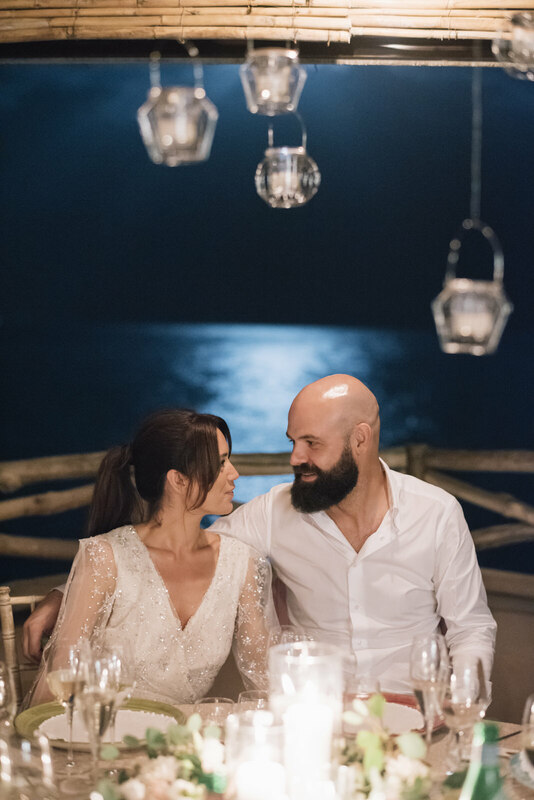 And here, Alyson and Dan became husband and wife. 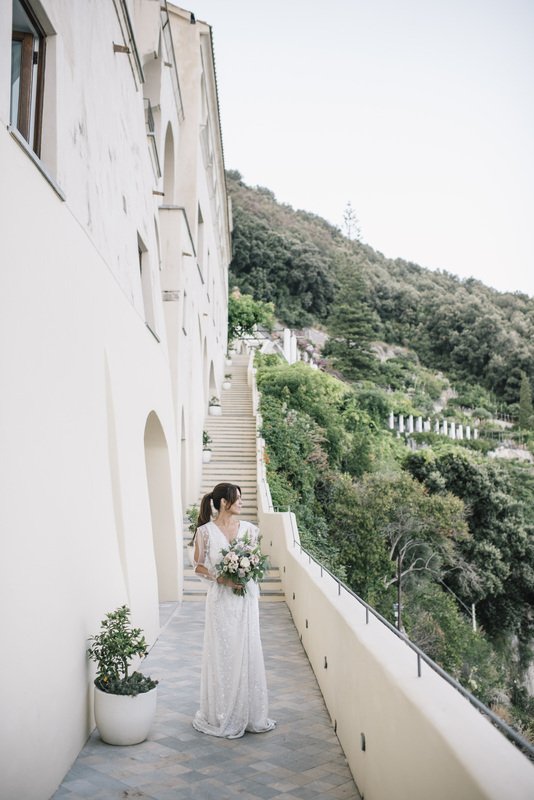 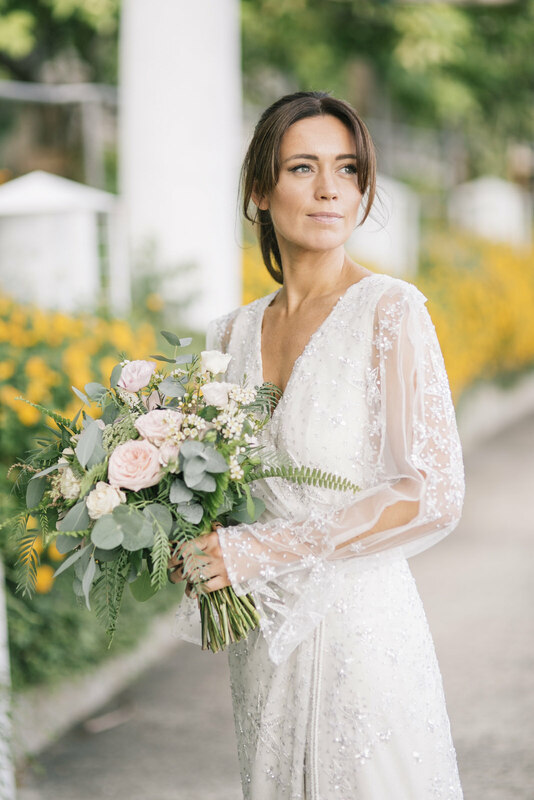 NH Grand Hotel Convent of Amalfi boasts a picturesque trail known as the Walk of the Monks overlooking the sea and shaded by a bower of bougainvilleas and lemons, along which we travelled to get some special pictures of the newly married couple. 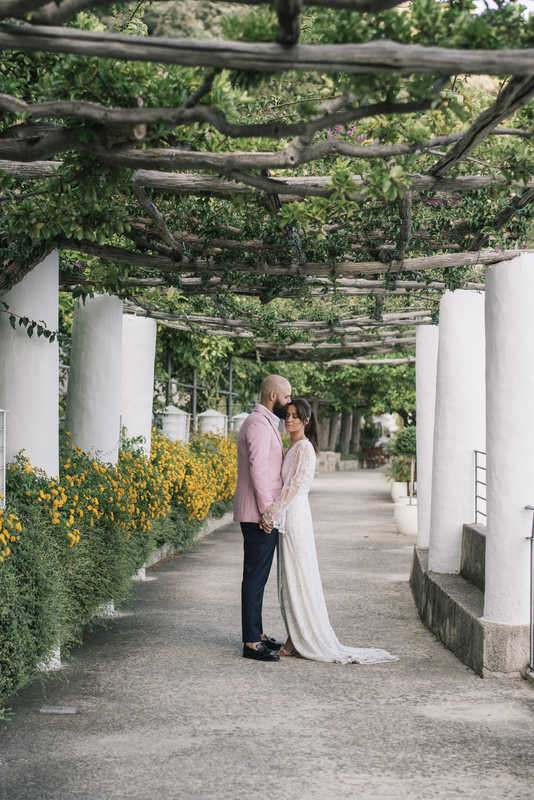 Alyson and Dan are two very sweet people and an incredibly close-knit pair. 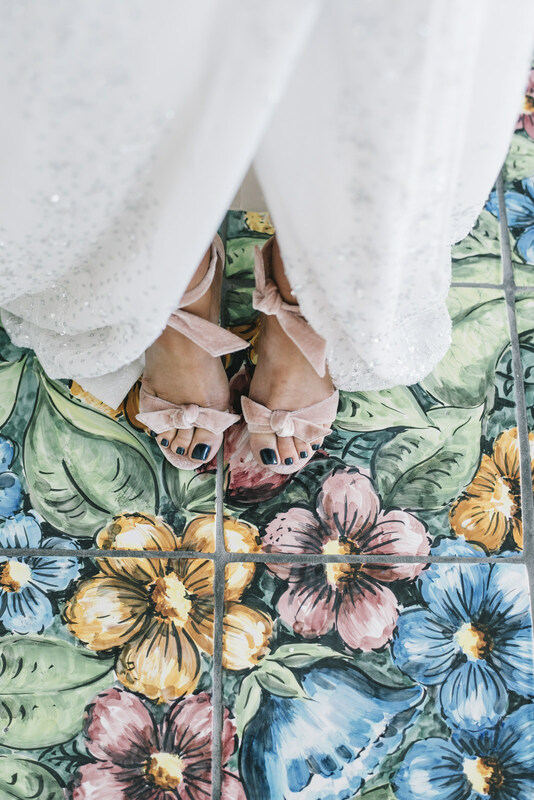 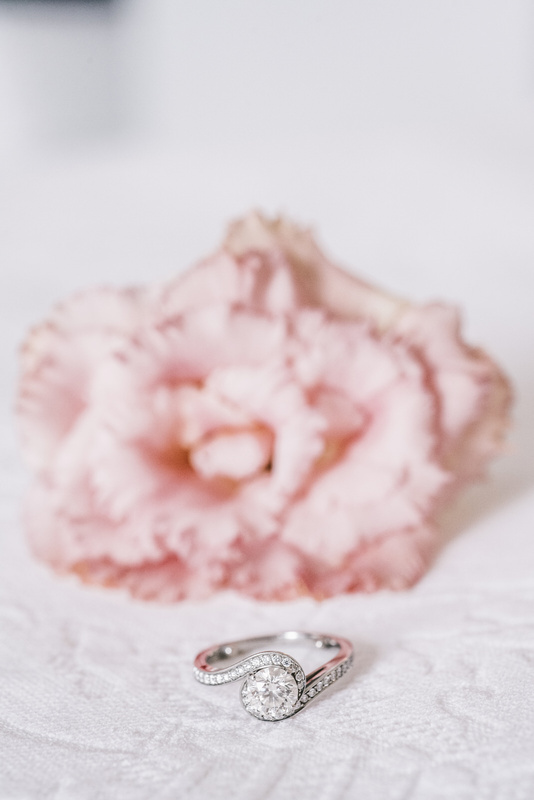 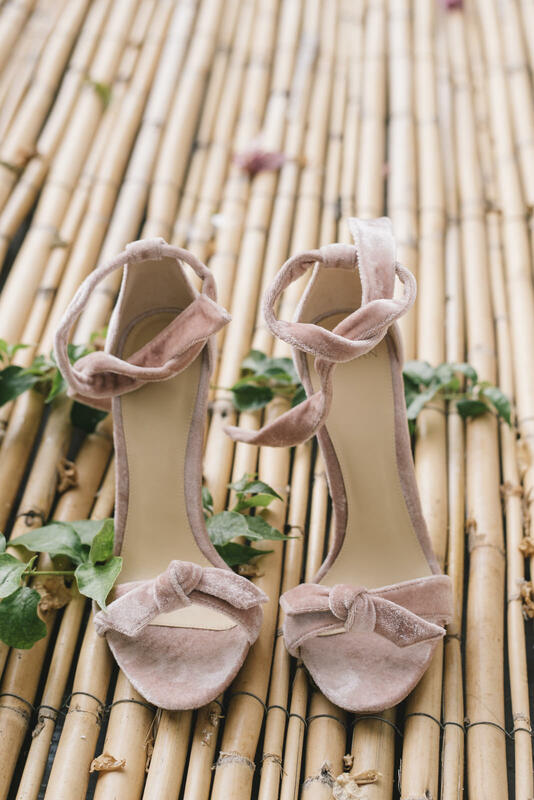 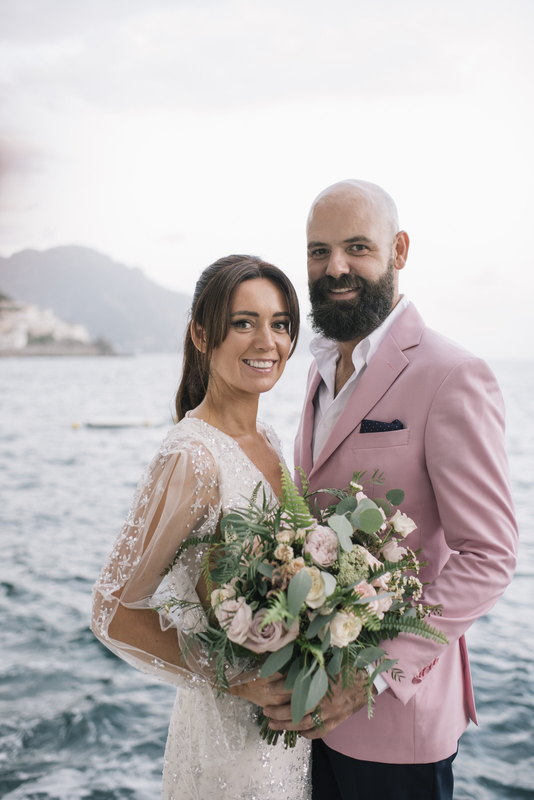 Pleasant and easy-going, they wanted to keep an informal look by choosing the sweetness and delicacy of the rose for their wedding on the coast. 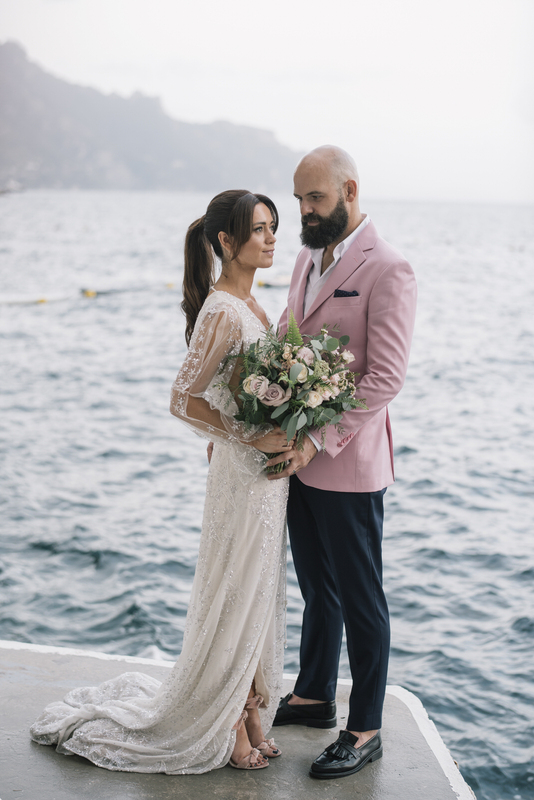 Alyson wore a Galia Lahav dress, with a soft line and a seductive side slit offset by powder pink shoes by Alexandre Birman. 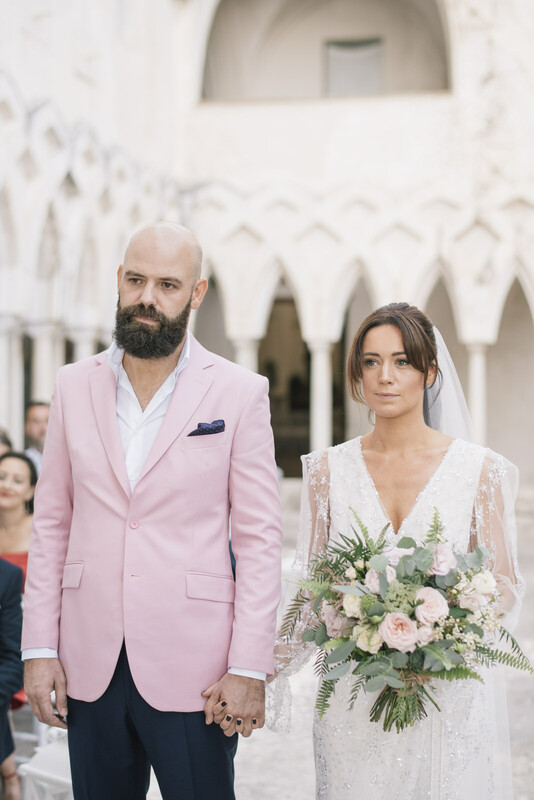 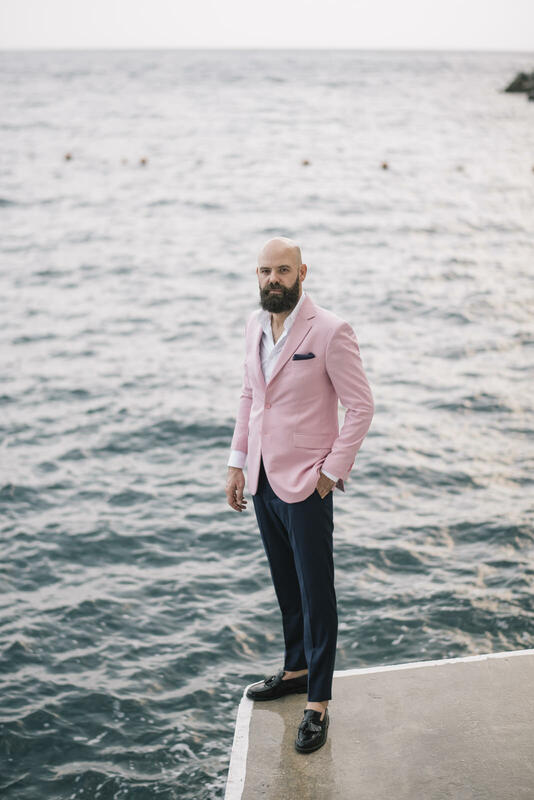 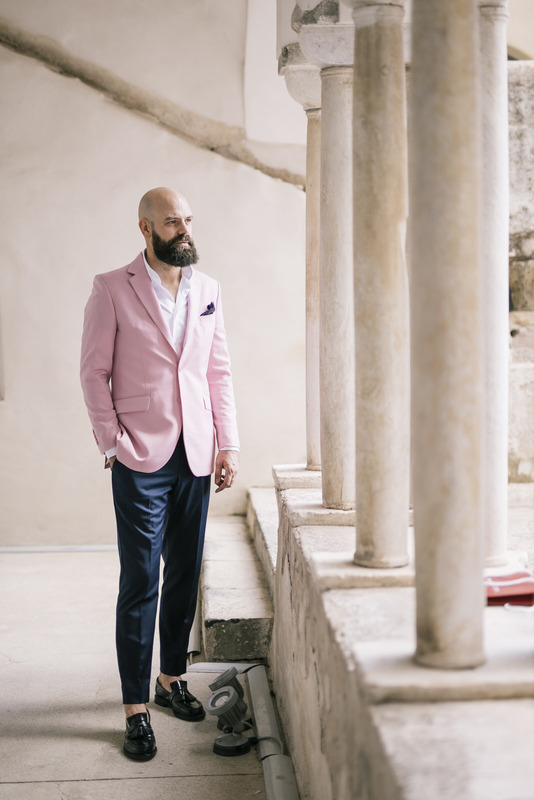 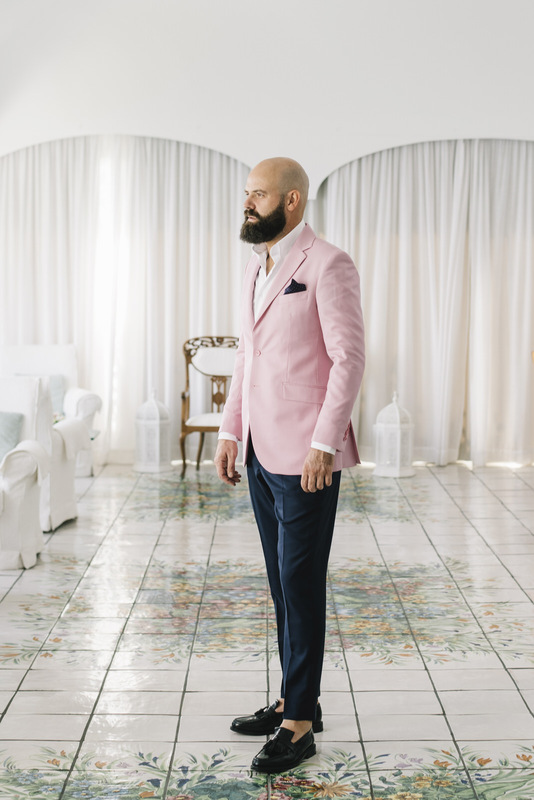 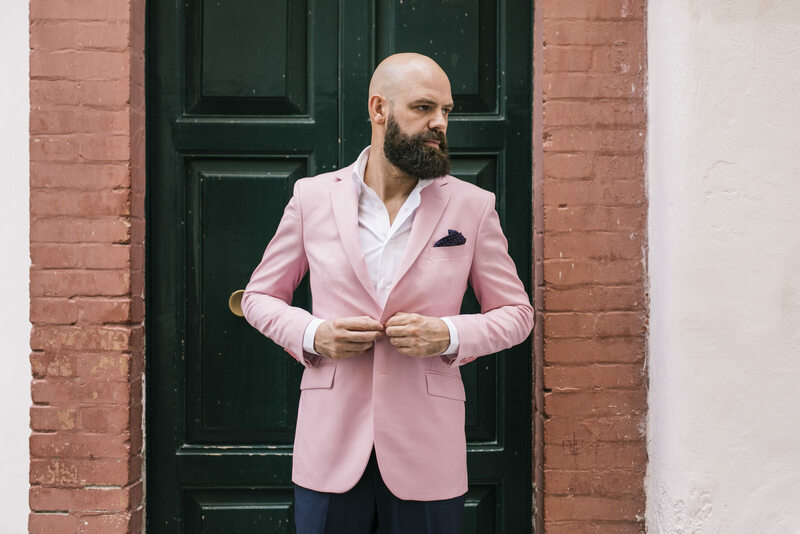 The leitmotif of the rose was then also followed by Dan, who opted for an informal look without a tie and a tailored suit designed by Diverso, with an original pink jacket, with a blue clutch bag to match the trousers and white shirt. 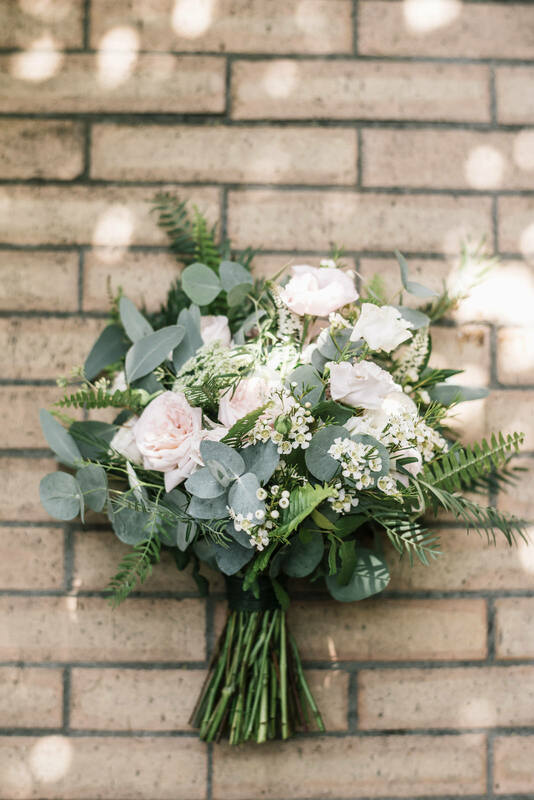 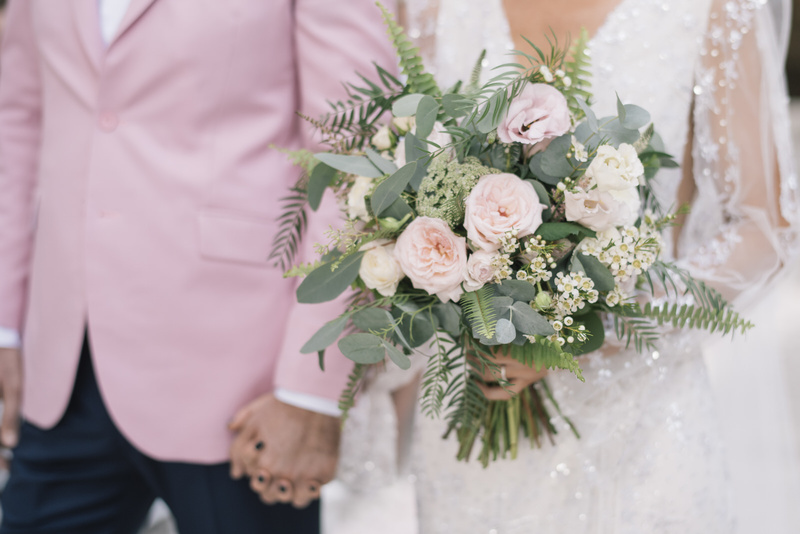 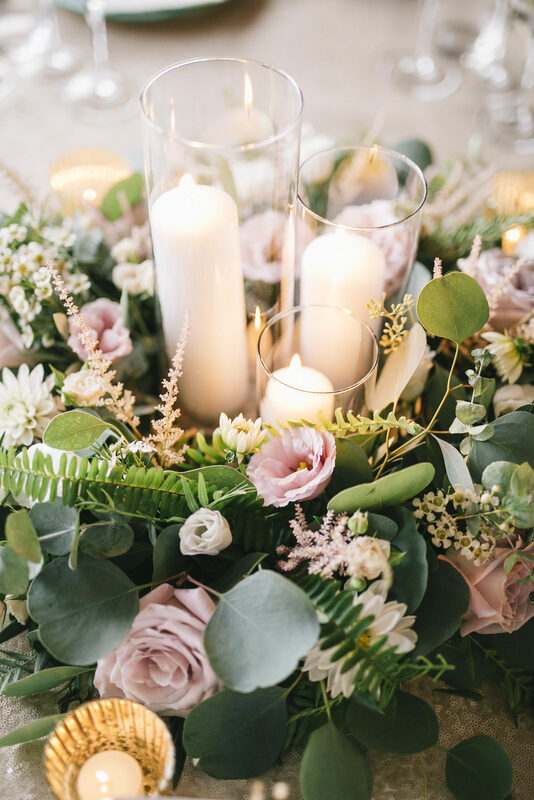 The bouquet, as well as the centerpieces, made by Il Fiorista was dominated delicate pink roses, surrounded by astilbe, wax flower, fern and eucalyptus. 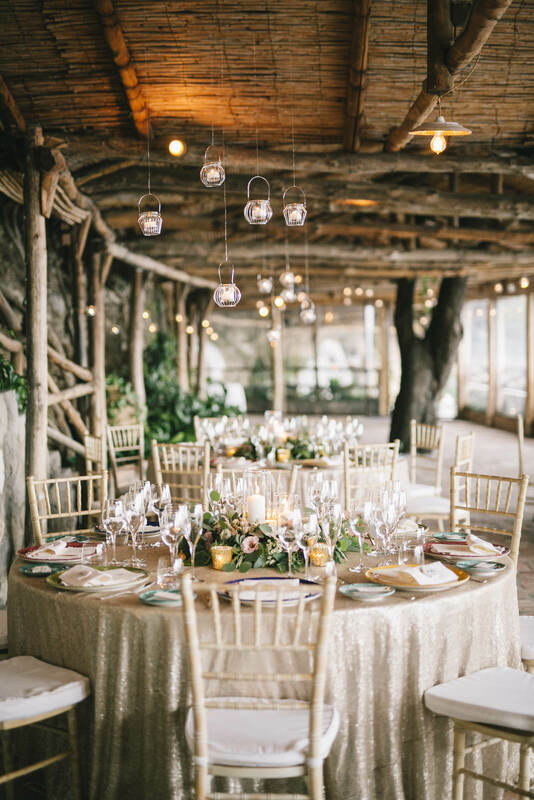 La mise en place was of typical local pottery of the dishes with matching table covers and candle holders. 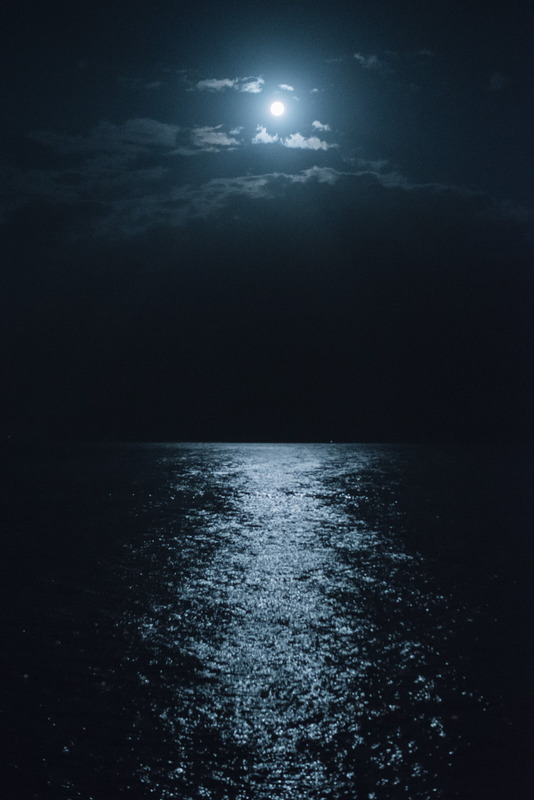 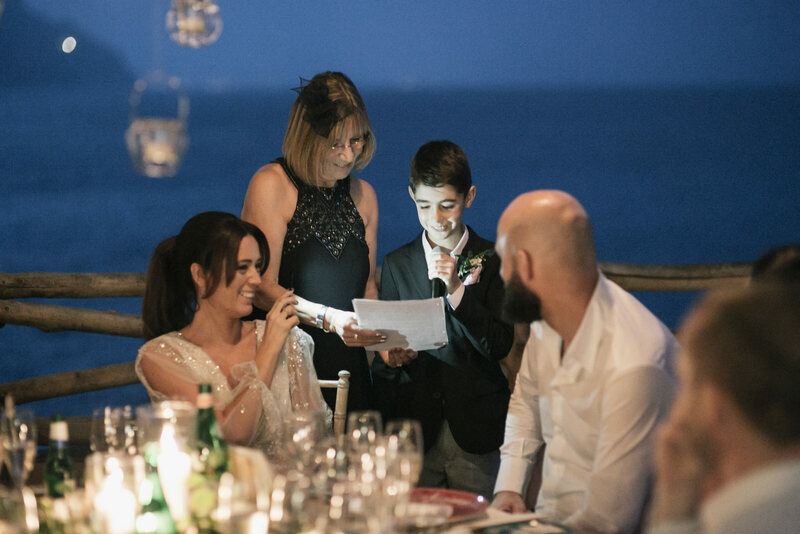 Refreshments and dinner were held at the renowned Hotel Santa Caterina, on a romantic terrace overlooking the sea that offers a spectacular view of the stretch of the coast that connects Salerno to Amalfi. 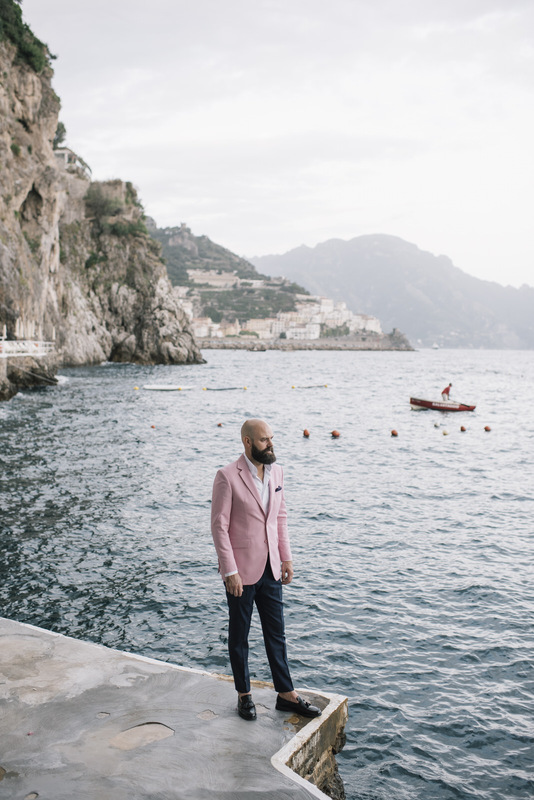 Before dinner we took the couple Alyson and Dan to the rocks below for some more shots, taking advantage of the wonderful blue background created by the sea. 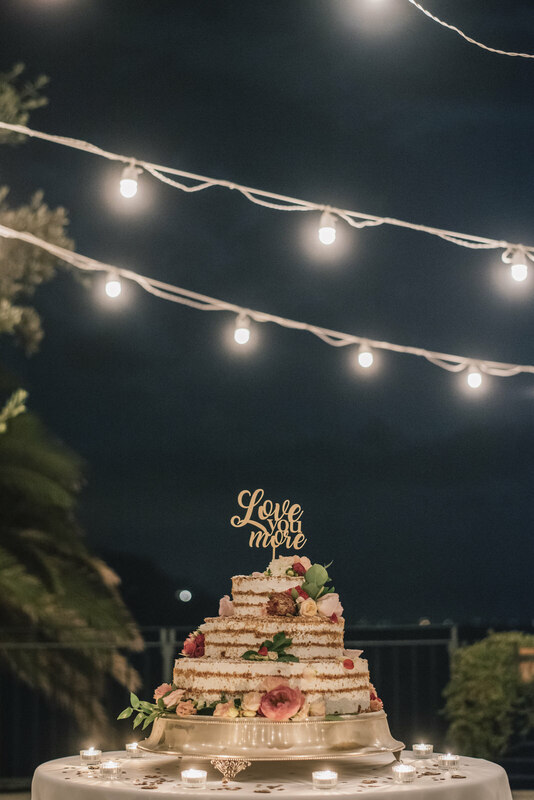 Once the dinner was over, we moved to the adjacent terrace to cut the cake. 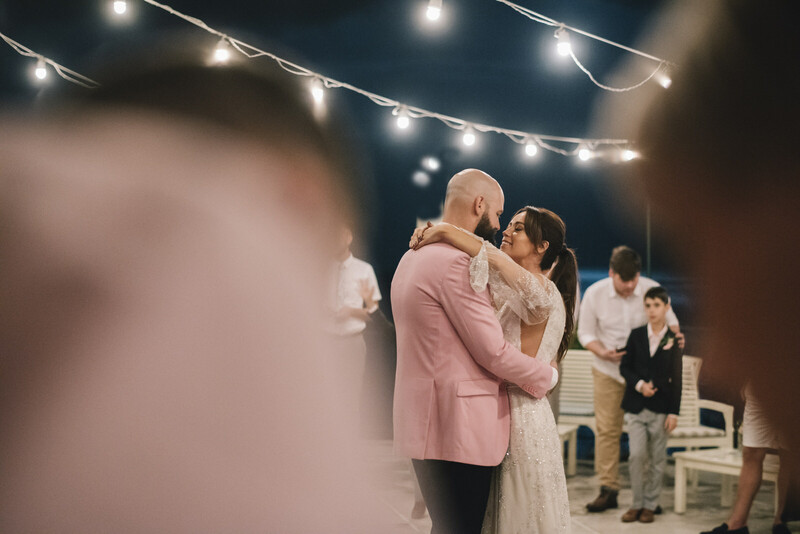 Here, Alyson and Dan performed their first dance as husband and wife, under the romantic moonlight and hanging Italian light bulbs. 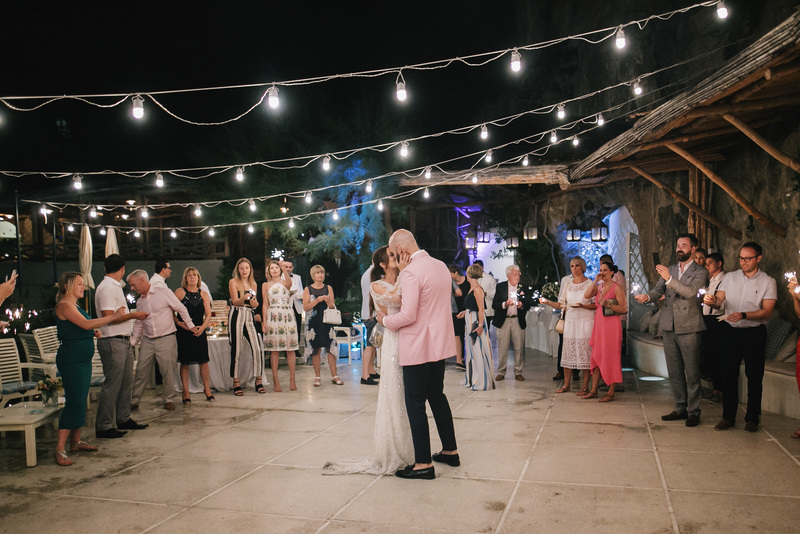 Afterwards, the dance party that marked the end of the celebrations was memorable for everyone present, organized in every detail from the experience of The Amalfi Experience that never fails to energise every event with enthusiasm of its amazing team. 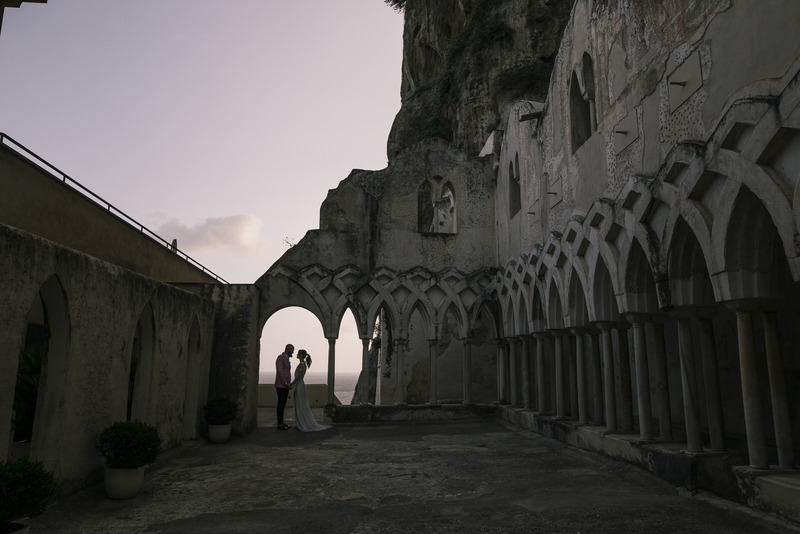 Are you planning your destination wedding in Amalfi and are you still looking for your photographer? 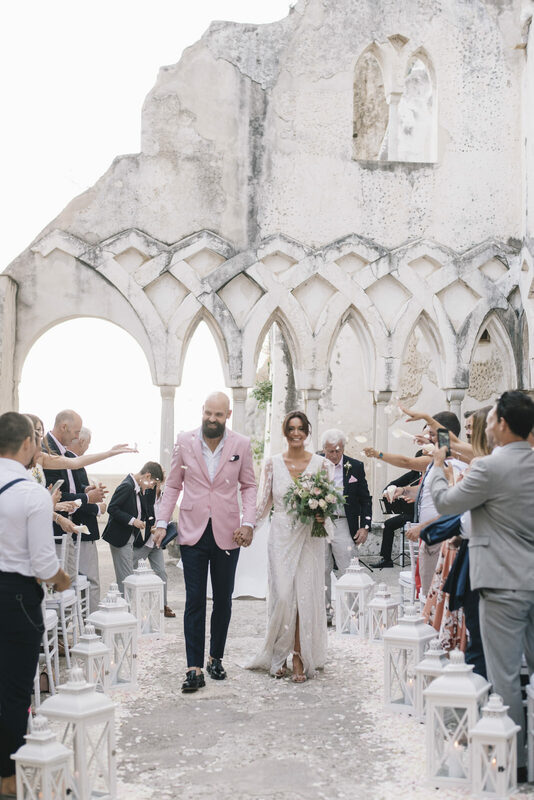 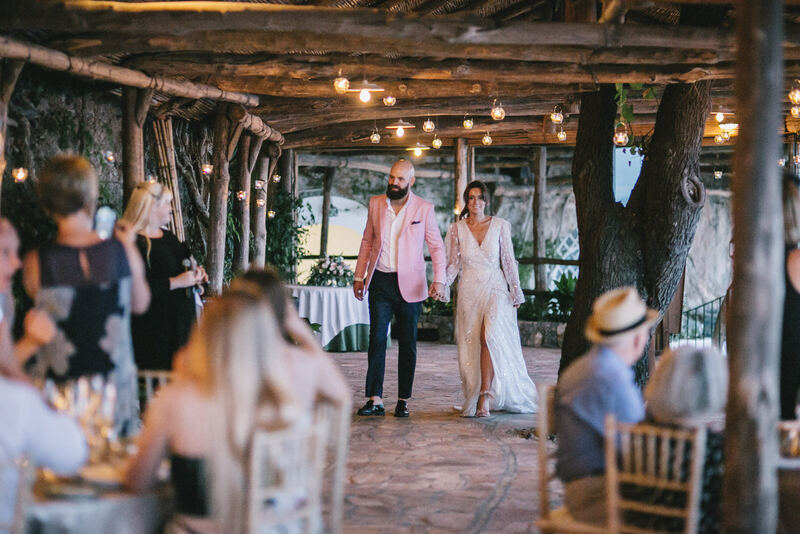 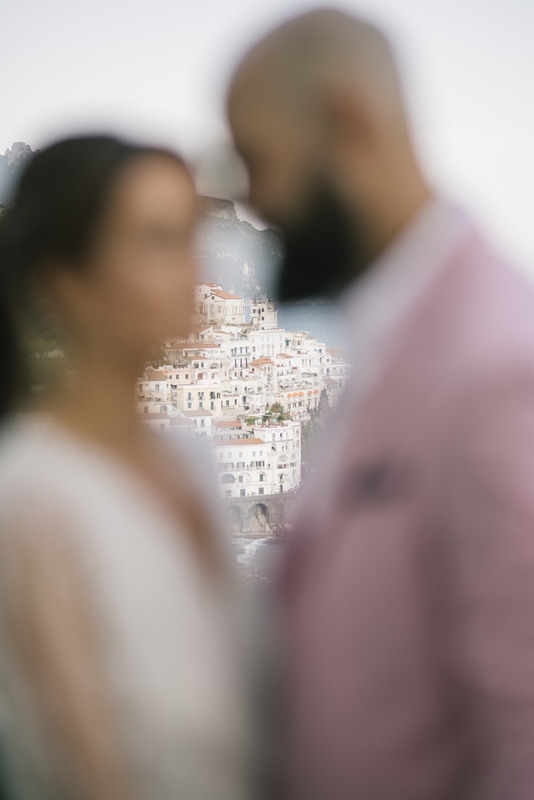 Check our previous blog posts “The charm of Amalfi for a destination wedding in Italy, Kristina & Joshua” or “A bright and classy summer wedding in Amalfi, Kimberly & Christopher” to see something more about us and let’s get in touch!